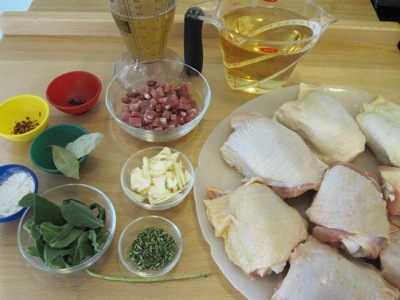 I pulled my mise-en-place together: eight chicken thighs (about three pounds), two cups of dry white wine, one cup of chicken stock, two ounces of quarter-inch thick prosciutto cut into quarter-inch cubes, four cloves, a quarter teaspoon of red pepper flakes, two bay leaves, twelve whole fresh sage leaves, four medium garlic cloves sliced lengthwise, two teaspoons of flour, and the reserved stem and minced leaves from a four-inch rosemary sprig. I heated the oven to 325 °F, then heated a teaspoon of olive oil in a skillet over medium heat. I added the prosciutto and cooked until it just browned, then added the sliced garlic, cooking again until golden brown. 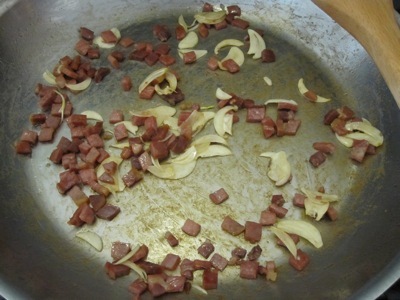 I removed the prosciutto and garlic, added two more teaspoons of olive oil, and increased the heat to medium high. I seasoned the thighs with salt and pepper, adding them to the pan when the oil was just smoking. I browned the thighs om the skin sidfe for eight minutes, the turned them and browned the other side for an additional five minutes. I removed the thighs to a plate, poured off all but two tablespoons of the fat, then added the flour, stirring for one minute. I added the wine and stock, brought it to a simmer, and let it cook for about three minutes. The rosemary stem, sage, cloves, peper flakes, bay leaves, and reserved prosciutto and garlic were added next. 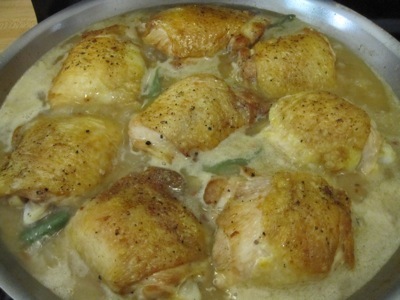 Finally, I returned the chicken to the pan, skin side up, so that the skin sat above the surface of the the braising liquid. The whole pan, uncovered, went into the oven for an hour and fifteen minutes. While the thighs cooked, I started a savory polenta, using Alton Brown’s recipe. I set some red onions to sweat in olive oil, added minced garlic, then a quart of chicken stock. 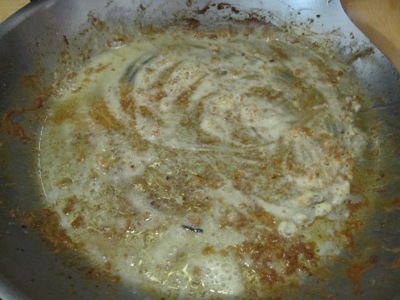 When the stock came to a boil I slowly whisked in a cup of coarsely-ground cornmeal. I covered the pan, put it in the oven with the chicken, and stirred every ten minutes for forty minutes total cooking time. 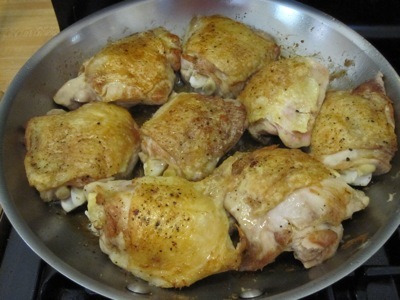 I removed the chicken from the oven, transferred the thighs back to a plate, and reduced the cooking liquid. 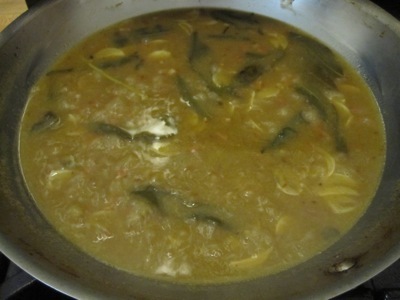 I remembered to remove the rosemary stem, cloves, and the bay leaves, but left the sage leaves in the pan. D’oh! 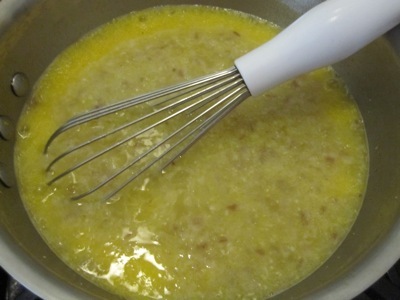 When the sauce was reduced, I finished it with the minced rosemary, a tablespoon of lemon juice, and two tablespoons of butter. No additional salt was necessary due to the prosciutto. I served the chicken over the polenta, adding the sauce (minus the sage leaves) around the thighs. This one’s a keeper. The skin remained crispy, the sauce was richly flavored, and the polenta was hot and creamy. 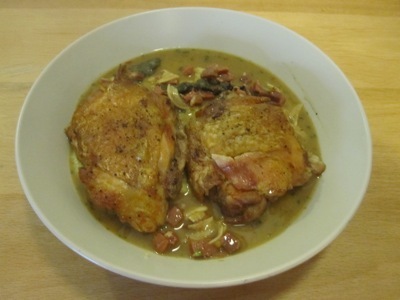 It was a perfect cold-weather dish for an unexpectedly chilly April day.